Query letter success depends upon whether or not you can get the attention of the editor. Your query letter is the point where you and the editor first “meet”. In my ten-year quest to find THE magic formula for effectively pitching travel stories, I’ve studied much literature about query letters. My research points to two types of query letter success formats. One format is recommended in all the books about query letters. I call it the “elegant dance”. The second format, and my favorite approach, is what I call it the Direct Pitch Technique. In this article you'll find my analysis of both of these query letter success formats. 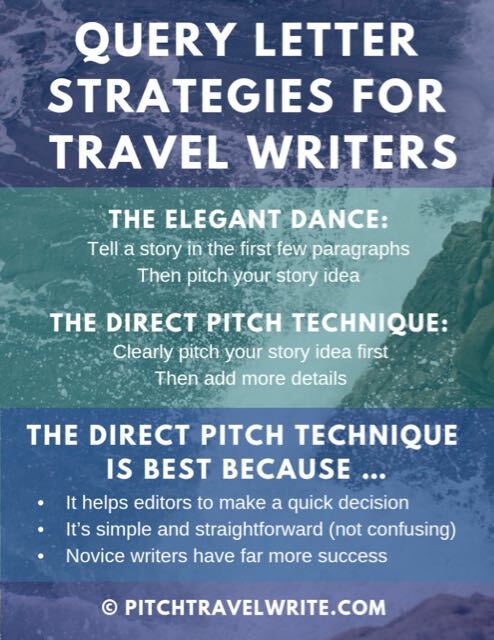 And then I’ll explain why my Direct Pitch Technique is the one that’s most successful for landing travel assignments, especially if you're new to travel writing. Without fail, books about query letters recommend this technique. With this technique, you tell a little story in your first few paragraphs to hook the editor. Then later you pitch your story idea. Here’s an example of a query letter using the elegant dance approach. It starts by telling a little story that you hope will entice an editor to purchase your story. Every year almost two million people stroll for hours among exquisitely carved life sized metal and marble statues in a 109-acre green memorial park in Paris’s well-heeled Republique district. They come to see what are considered by many to be the finest collection of funeral sculptures in the world. At Pere Lachaise cemetery, sculptors, art aficionados and tourists wander the quiet, uneven gray cobble stoned labyrinth of streets, admiring the hundreds upon hundreds of superbly wrought water- streaked bronze and green weathered copper statues, and smooth flawlessly carved white marble statues of perfect angels, nymphs, and small children. This example spends two paragraphs setting the stage. In the third paragraph I make my pitch. I call this method the “elegant dance”. "With the elegant dance approach, your mini-story must be captivating and well-written. It's really easy to screw up this kind of query!" The “elegant dance” query gives you the opportunity to display your writing abilities and paint a vivid picture of your proposed story. You try to hook the editor with your mini-story, so when you get to your pitch he'll want to buy it. Stylish query letters are akin to a finely tuxedoed gentleman with fancy footwork in a grand ball waltz. If the elegant dance is done right, it wows the audience. However, if the tuxedoed gentleman missteps and stumbles, or is just a little out of sync with the music or his partner, everyone is aghast at this simply awful spectacle and politely averts their eyes. If you write a query letter using this method and you do it perfectly, an editor will be wowed and buy your pitch. That’s your goal. But your mini story must be interesting and well-written or it is doomed to deletion. And that’s the problem with the “elegant dance” query letter. You won't have much query letter success with editors if it's not done well. Your pitch can be too wordy or long-winded. You can weave a circuitous path that loses the editor halfway through. Sometimes they're so ambiguous the editor can’t figure out what story you’re pitching. In other words, it’s really easy to screw up the elegant dance query letter. 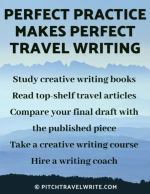 Most travel writers put so much colorful prose into their lead sentence or paragraph, that the true nature of their pitch is lost in a sea of flowery sentences. It takes too long to tell the editor what your proposed story is actually about. Poorly written “elegant dance” queries come across as clumsy and amateurish. It shows the editor that the writer is clearly a beginner, and in over his head. I’ve read hundreds of queries written by new travel writers. Many of the brave writers who attempt the “elegant dance” query typically fall short. Writing this kind of pitch takes A LOT of practice. “Elegant dance” query letters require a talent and skill that can take most average writers years to develop. Unless you’re a talented writer, you are less likely to succeed with an “elegant dance” query. Even with ten years of freelance writing under my belt I've seldom used the “elegant dance” query. 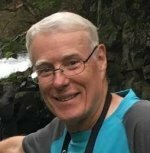 Although I’ve had several “elegant dance” query stories published, their number pales in comparison with the sheer volume of stories I’ve had published using a different approach. The best query letter success technique is one I use most frequently: my Direct Pitch Technique. This query letter success format has resulted in a landslide of freelance magazine assignments for me - so much so that I rarely bother using the “elegant dance”. There’s no mystery or romance about my Direct Pitch Technique. You use a direct approach in your query letter and present your story idea clearly and simply in the first sentence or two. Then you elaborate in the subsequent paragraphs. The editor knows exactly what you're pitching after reading only one or two sentences. This is a strength! It makes it easy for the editor. Sure, you don’t get to strut your stuff or do any fancy footwork at the start. But all is not lost. You can (and should) show your best creative writing skills in the following paragraphs, after your pitch. The editor can make a decision immediately after reading the first paragraph. They will either read the rest of your pitch, or hit “delete”. It’s simply not fair to expect editors to read through several epic paragraphs that read like they were handcrafted by Shakespeare. You want them to read an uncomplicated pitch. Don’t make them work to figure it out! Editors will appreciate your no-nonsense, straightforward pitch. 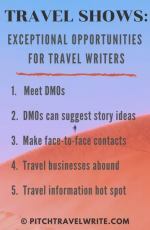 Here are three examples of this query letter success strategy, a straight up approach from my book, The Complete Guide to Query Letters for Travel Writers. This opening sentence got my story published in Northwest Travel & Lifestyle Magazine. It was the first of dozens of my stories published in this excellent magazine. I’d like to submit a piece telling Northwest Travel readers about a fascinating living ghost town and its atmospheric cemetery, just off Interstate-90 in Washington. For bored and jaded Seattle-ites wanting to get away from it all, yet who want to stay close to home, Roslyn, Washington, is a perfect antidote. This next pitch got my story about the Paris Catacombs into Renaissance Magazine. I’d like to submit a piece telling Renaissance readers about “The Subterranean Empire of Paris’s Ancient Catacombs”. Underneath Paris, the City of Lights, there is a darker world. Every year over 150,000 curious people visit part of a labyrinth of 186 miles of eerie ancient subterranean tunnels known as the catacombs, twenty meters below the bustling streets of Paris. These catacombs are one of the most extraordinary places in the world, and not well known to most tourists . . . This final example got my story about the Pacific Coast Schooner Rendezvous into prestigious Classic Boat Magazine. I’d like to submit a piece telling your readers about the Pacific Coast Schooner Rendezvous in Tacoma, Washington. On April 24 & 25, Tacoma’s renown Thea Foss Waterway will be packed, bow to stern, with over 15 magnificent antique schooners from along the Pacific coast. With their fore-and-aft sails billowing from two tall wooden masts, these beautifully crafted ships, mostly built between 1900 and 1920, will bring a bygone era of sailing back to nautical fans. Three different examples that worked in three different kinds of magazines: a regional travel magazine, and two specialty niche magazines. You can see how clearly each pitch is presented in these examples. When reading the opening sentences of these pitches there is absolutely no doubt what my pitch is about. It’s spelled out and in your face. 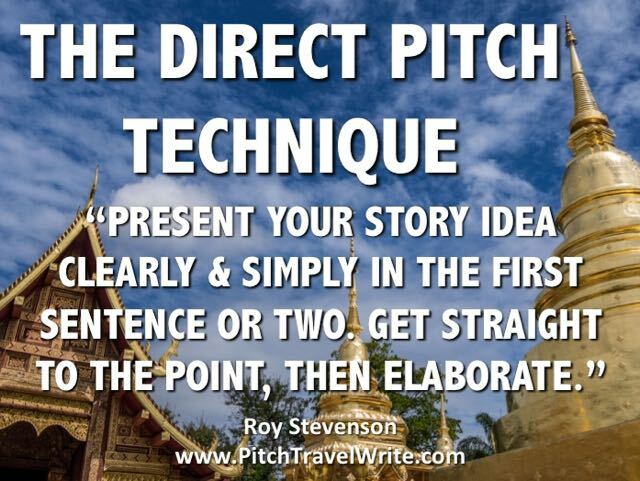 With my Direct Pitch Technique all I’m recommending you do differently is put your clearly stated pitch into the first sentence or two. It's a small change with a big impact - more success! Many veteran writers are mortified with this direct approach, but they have the expertise to use a query letter success strategy like the "elegant dance". I maintain that most editors appreciate it when you get straight to the point, as I have done with the above real life examples. Editors are usually in a rush. They’re very busy people, constantly juggling multiple projects to get their next issue out the door. They just want to know what your story angle is. If you send a straight-to-the-point query, the editor can send you an acceptance email or a rejection within a few minutes of scanning your query. In my experience, you'll have the most query letter success with straightforward queries. If your opening sentence is a clearly stated pitch, you have the remainder of the query letter to be as creative and stylish as you like. Just make sure you don’t meander off-track and lose the editor later with your dance! My case for the Direct Pitch Technique is based on the ultimate proof—getting hundreds of my own articles published. This technique has worked for me and helped me sell 90% of my pitches. Most freelancers consider themselves lucky to sell 25%-40% of their stories. Clearly I’m doing something right. My Direct Pitch Technique also works for my coaching clients. When they send me their draft queries, the first thing I suggest is to move their pitch to the first sentence. Often that’s the single change that makes the editor take notice and accept their pitch. 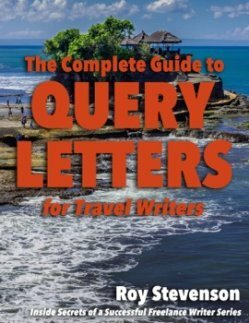 I’ve also heard from dozens of writers who used queries from my book The Complete Guide to Query Letters for Travel Writers as a template for their own successful queries. This method works well for anyone willing to try it. If you’ve been using “elegant dance” queries and getting your stories published, I say “congratulations”. Stay with it. You obviously have the writing talent to pull it off. But if your queries have been ignored, or you’re unsure of your abilities, then I recommend trying my Direct Pitch Technique. You're bound to have better query letter success with editors. It’s easy! And it may be just the small tweak that you need to get the editor’s attention and acceptance.